The flavors of this cake, honey, orange, almond, vanilla, and apricots make me happy. I’d be excited to eat this for breakfast with coffee, as a casual lunch dessert, or fancied up with honey caramel and whipped cream after dinner. I chose to use Aunt Sue’s Raw and Unfiltered Honey for this recipe because the honey is not cooked, so it’s a perfect time to incorporate raw honey. Also, Aunt Sue’s Raw and Unfiltered Honey is a product of the Sioux Honey co-op, which supports American beekeepers. Preheat oven to 350°F/177°C. Butter a 9” round tart pan. Set buttered tart pan on a baking sheet and set aside. In a medium mixing bowl, whisk together the almond flour, flour, baking powder, and salt. In the bowl of a stand mixer fitted with a paddle attachment, cream together the butter and sugar. Add both extracts and zest to the butter mixture. Mix on low to incorporate. Add in the eggs, one at a time, to the butter mixture. Mix on low until the mixture is smooth before adding the next. Scrape down the bowl as needed. Add half of the dry ingredients to the mixture. Mix on low until few streaks of flour remain. Scrape down the bowl, and add in the remaining dry ingredients. Mix on low until combined and smooth. Spread the batter in to the prepared tart pan. 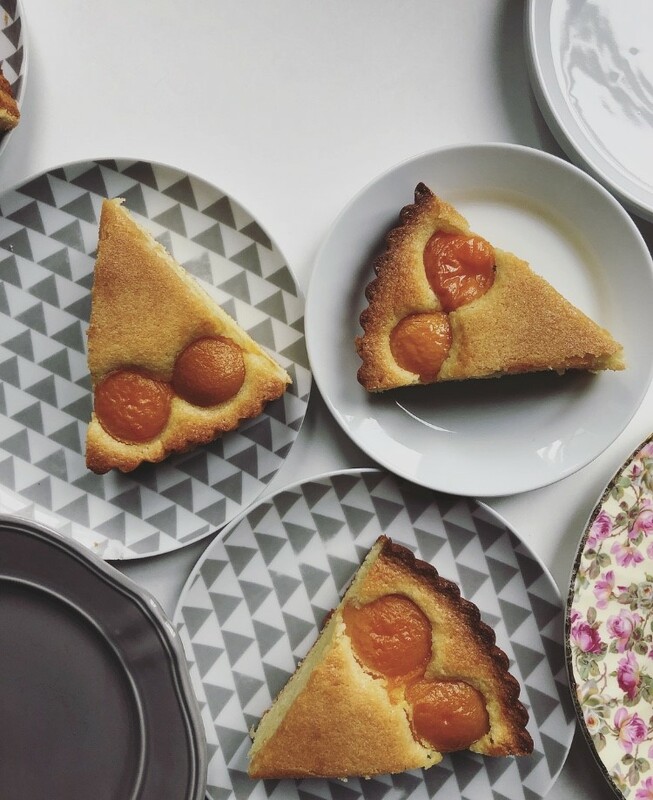 Place the apricot halves, smooth side up, on top. Gently press the fruit in to the batter until the edges are about 1/4 inch in to the batter. Bake at 350°F/177°C until the frangipane is puffed, golden brown, and feels set when gently touched, about 50-60 minutes. Once the cake is baked, brush the hot cake with honey. Carefully remove from pan, and serve warm or at room temperature. *Two cans should yield enough apricots. I used the best looking apricot halves from two 15 ounce cans. Canned peaches work just as well. Thank you to Aunt Sue’s Raw & Unfiltered Honey for sponsoring this post! Anything that I have said about Aunt Sue’s and its product is accurate and reflects my honest opinion and experience. Sue Bee Honey and Aunt’s Sue’s Raw & Unfiltered Honey can be found in most major grocery stores or are available online at www.siouxhoney.com.